John R. Anderson has been long been at the forefront of the study of cognition, with accomplishments that have informed the way cognitive psychology is investigated, applied, and taught. 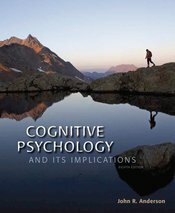 With this new edition of his classic textbook, Anderson again takes students to the forefront of the field, incorporating the latest theoretical breakthroughs, research findings, and technological advances, as well as marking the increasing role of neuroscience in the study of cognitive functions. As always, Anderson makes his discussions of higher mental processes concrete and accessible with fascinating examples and clear explanations of the underlying research.